The thought of creating a high school transcript, a "one-page overview of your child's academic record" can put fear into even veteran homeschoolers. That fear is only magnified if your child is not following a traditional high school program for whatever reason. Perhaps you are unschoolers, or your child has had a medical or psychological illness, or he or she did poorly in a brick and mortar high school but is now doing better as a homeschooler, or your child has special needs. 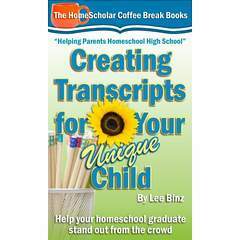 Lee Binz, founder of The Home Scholar, offers an excellent guide to creating transcripts in these types of situations. In addition to describing how to assign and record credits and activities, Binz also discusses the role of a cover letter, and how to paint your child in the most positive light. The only thing this book doesn't provide are examples of how to physically set up the transcript. That would have been a helpful component. Still, this is an encouraging short book with tons of practical information. From the Irish Setter, Danny, she learned about acceptance, self-knowledge, enjoyment, assertiveness, purpose, balance, and empathy. From the Golden Retriever, Duffy, she learned about rejection, woundedness, relationships, insight, presence, diversity, and beauty, while the Caique (parrot) taught her about change, materialism, play, love, adventure, essence, and respect. 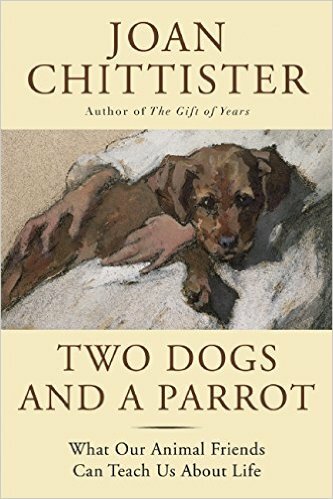 Chittister reflects on each of these traits, how the particular animal illustrated them, and then applies that lesson to human life. As any pet-owner knows, animals do change your life. Each one is unique with his or her own personality (much like children!). The animal and owner need to learn how to coexist and make the most of the relationship. Animals do have much to teach us if we take the time to slow down, observe, and appreciate the lessons that they have to offer. Chittister writes, “I know that because of my animal companions my own small soul has been awakened to more of life than I could ever found without them.” That is no doubt true of all of us who have welcomed an animal into our lives and our hearts. Two Dogs and a Parrot will appeal to any pet owner or anyone who wonders what animals might have to teach us humans. What if There Were a Cure for Aspergers? John Elder Robison is a world-recognized authority on life with high functioning autism, also known as Asperger’s Syndrome. The best-selling author of “Look Me in the Eye,” “Be Different,” and “Raising Cubby,” he has worked to help people understand what life is like for those with Asperger’s and to gain acceptance for those whose brains work differently. Yet, when he was offered the chance to take part in an experimental research study utilizing TMS, transcranial magnetic stimulation (basically energetic stimulation of targeted parts of the brain), in order to discover the underlying brain causes of autism and see if it would help change autistic brains, he jumped at the opportunity. In “Switched On,” he tells of what happened next. His results were unexpected and certainly not the same as that which everyone who took part in the study experienced, but they open up the possibility of brain transformation and the pros and cons of such a treatment. The treatments had both immediate effects that sometimes faded as well as long-lasting effects that are still with him. He is a changed man. He became able to make eye contact, something he had always avoided. He also began to be able to read and feel empathy for other people’s emotions. It even impacted his hobby of taking photographs – his use of color changed as well as his compositional style. He also had to deal with changing relationships as he came to terms with social mistakes he had made and reinterpreted events in his past in a new light. Robison promised the researchers that in his book, he “would do his best . . . to share both the promise and risk and complexity of these new technologies.” He has succeeded in this mission. He discusses his own experience as well as the ethical question of whether we should even be trying to fix Asperger’s seeing as those with this syndrome often have talents in a particular area that might be lost. In trying to change them, the world might be losing the inherent benefit they can bring to the world. This isn’t a simple situation. As the mother of one diagnosed teen Aspie and another who I believe is on the spectrum as well, I admit I’m conflicted about the potential for these new technologies. They aren’t available to the general public yet, but they hold some promise. I see first-hand the struggles my sons have with social cues, fine motor skills, and learning disabilities. They don’t lie, which can be a positive, but their honesty can also be brutal, and unless I am actually crying (which doesn’t happen that often), they never can sense that I am upset. I know they love me and that it is not intentional, but it still hurts. I have an adopted neurotypical daughter. One day when she was about three years old, she had done something I didn’t like and I had made a face at her. “Why are you mad at me?” she asked. It was such a simple question but it shocked me. I had been a parent for thirteen years, but it was the first time one of my children had picked up on a nonverbal cue that I was upset. Would my children be “better” if these issues could be fixed? Maybe, but they would also be different. In any event, my children are well on their way to adulthood and any widespread use of this technology is a few years out. It will be up to them if they ever want to pursue it. 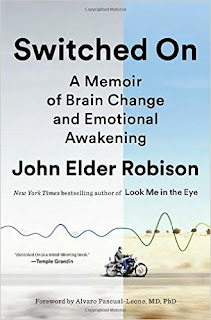 As Robison indicates in “Switched On,” the therapy seems to work better on adults anyway, having a more long-lasting effect, perhaps because they have more experience to work with. 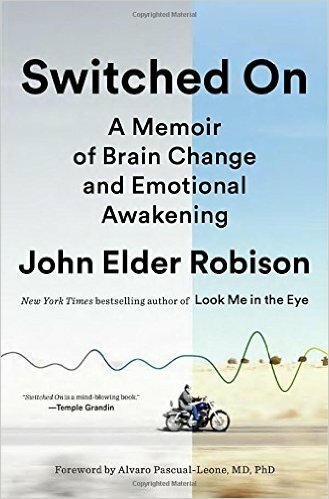 “Switched On” makes for compelling reading for anyone interested in Asperger’s or the ethics of brain-changing treatment. It raises more questions than it answers, but Robison’s first-hand account is an important part of the conversation. Today I am pleased to be hosting the book tour for the latest Catholic Fiction offering from Full Quiver Publishing. 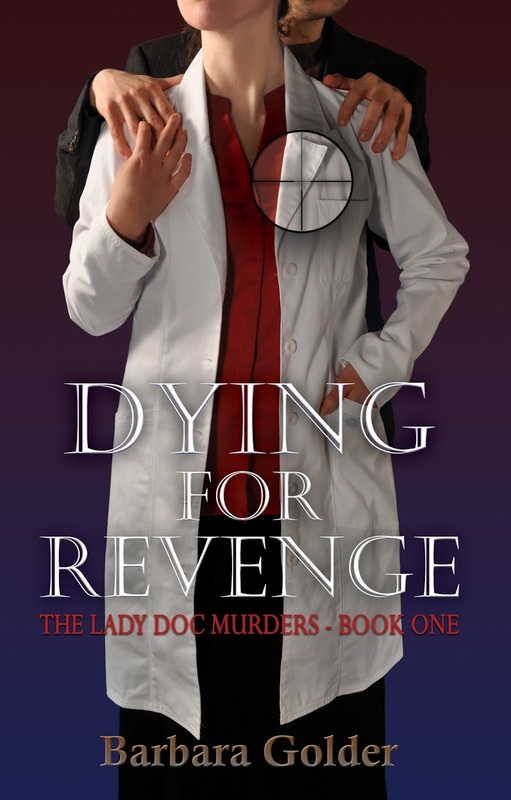 Dying for Revenge by Dr. Barbara Golder is the first in the Lady Doc Murders series. Someone is killing the rich and famous residents of Telluride, Colorado, and the medical investigator, Dr. Jane Wallace, is on a collision course with the murderer. Compelled by profound loss and injustice, Jane will risk her own life to protect others from vengeful death, even as she exacts a high price from those who have destroyed her world. DYING FOR REVENGE is a story of love, obsession and forgiveness, seen through the eyes of a passionate, beautiful woman trying to live her life -- imperfectly but vibrantly -- even if she won't survive.